Ed Lewis, executive director of CE National, was the keynote speaker in the 10 a.m. general session of the Grace Brethren national conference this Wednesday morning. Lewis spoke on “grace,” using the Old Testament character Manasseh as an example. “We must be people of Grace,” Lewis exclaimed, citing several examples of sinners who were treated with grace and restored. “Otherwise, let’s take ‘Grace’ out of the name ‘Grace Brethren,'” he said. It was reported in the Wednesday morning meeting that the offering taken Tuesday night for the Project Hope and Charite orphan care center in Central African Republic had topped $30,000. 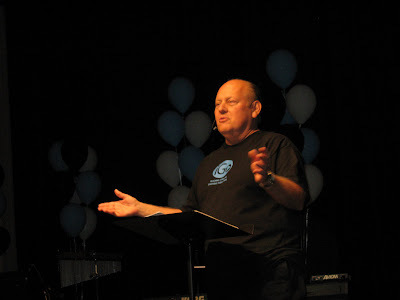 Incoming FGBC moderator John McIntosh, pastor of the Grace Brethren Church of Simi Valley, California, is the keynote speaker for the Wednesday night 7 p.m. session. The conference concludes Thursday morning with a “delegate’s brunch” and FGBC business meeting at 10 a.m.